Neurons often exhibit a complex chemical distribution and topography; therefore, sample preparation protocols that preserve structures ranging from relatively large cell somata to small neurites and growth cones are important factors in secondary ion mass spectrometry (SIMS) imaging studies. Here, SIMS was used to investigate the subcellular localization of lipids and lipophilic species in neurons from Aplysia californica. Using individual neurons cultured on silicon wafers, we compared and optimized several SIMS sampling approaches. After an initial step to remove the high salt culturing media, formaldehyde, paraformaldehyde, and glycerol, and various combinations thereof, were tested for their ability to achieve cell stabilization during and after the removal of extracellular media. These treatments improved the preservation of cellular morphology as visualized with SIMS imaging. For analytes >250 Da, coating the cell surface with a 3.2 nm-thick gold layer increased the ion intensity; multiple analytes previously not observed or observed at low abundance were detected, including intact cholesterol and vitamin E molecular ions. However, once a sample was coated, many of the lower molecular mass (<200 Da) analyte signals were suppressed. The optimum approach depended on the analyte being studied; the approaches evaluated included rinsing with water and cell stabilization with glycerol and 4 % paraformaldehyde. The sample preparation methods described here enhance SIMS imaging of processes of individual cultured neurons over a broad mass range with enhanced image contrast. 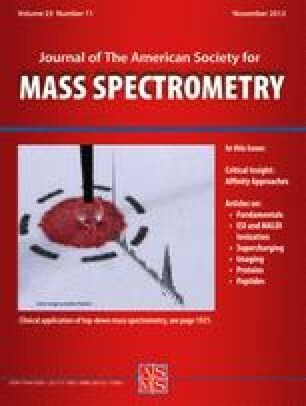 Secondary ion mass spectrometry (SIMS) was perhaps the first established mass spectrometric technique. The technology to produce secondary ions was introduced in the late 1940s  and was used to analyze solid surfaces by the early 1960s . SIMS imaging consists of three primary components that affect the experimental outcome: sample preparation, ion production and mass separation/detection. For a more in-depth analysis of each of these areas, see the following reviews [3, 4, 5, 6]. Regardless of the instrumental details, sample preparation methods often determine the success of an experiment and greatly impact image contrast, ion production, molecular weight range, and sample integrity. Multiple preparation methods have been utilized to image tissues and cells, including thin metal coatings [7, 8], volatile salt rinses [9, 10], chemical preservations , cryo-fracture [11, 12, 13, 14], and coating with a matrix-assisted laser desorption/ ionization (MALDI) matrix for matrix-enhanced SIMS [15, 16, 17]. As with other single cell mass spectrometric approaches [18, 19, 20], the appropriate sampling method for individual cell studies depends on the specific samples and the analytes of interest. Early in its development, SIMS was primarily employed for elemental analyses of inorganic solid surfaces [21, 22]. Biological applications for SIMS were explored for soft tissues by 1970 , although analyses using atomic ion sources were primarily limited to elements and small organic fragments [24, 25]. These works included imaging of subcellular distributions of boron  as well as several cations (e.g., Ca2+, Na+, and K+) [25, 27]. Additionally, amino acids were imaged via isotopic labeling studies using SIMS imaging . Now, SIMS is a versatile platform for probing a broad range of samples including tissues. SIMS imaging provides high spatial resolution on the order of 100 nm for smaller ions [28, 29]. The subcellular spatial distribution of several important lipophilic biomolecules such as vitamin E  and cholesterol  have been probed. While improvements in instrumentation technology, including the advent of cluster ion sources [6, 32, 33, 34], have led to the expansion of biological applications and an increase in the detectable mass range, the sample preparation step remains of paramount importance. In order to facilitate future studies on the subcellular distributions of an ever-increasing range of analytes, new sample preparation methods need to be developed . In this study, we compared different sample preparation approaches for SIMS imaging of analyte distributions in morphologically intact neuronal processes and growth cones of cultured invertebrate neurons. Our main goals were to preserve cell morphology and improve molecular ion signals. In order to determine the optimal sampling approaches for selected tissues, we specifically monitored and compared the intensities of a phosphatidylcholine (PC) fragment, cholesterol, vitamin E fragment, and sodium ions. While matrix effects have been reported related to PC and cholesterol , the study here is meant to highlight the effect that different sample preparations have on similarly cultured neurons, so the differences observed between preparations are believed to arise from the different sample preparations. Protocols performed best when tailored for the analyte of interest; those that allowed the broadest range of analyte distributions to be probed are detailed below. Chemicals were purchased from Sigma-Aldrich (St. Louis, MO, USA) and used without further purification. Aplysia californica were supplied by National Resource for Aplysia at the University of Miami (Miami, FL, USA) and kept in an aquarium containing continuously circulating, aerated artificial seawater cooled to 14–15 °C. Animals were anesthetized by an injection of isotonic MgCl2 (~50 % of body weight) into the body cavity and the pleural and pedal ganglia surgically dissected. In order to help remove the connective tissue, the ganglia were incubated in an enzymatic solution comprised of protease IX dissolved in artificial sea water (ASW), consisting of 460 mM NaCl, 10 mM KCl, 10 mM CaCl2, 22 mM MgCl2, 6 mM MgSO4, and 10 mM 4-(2-hydroxyethyl)-1-piperazineethanesulfonic acid (HEPES), adjusted to pH 7.8, with 1 M NaOH, for 30–60 min at 34 °C. After several washes of the treated tissues with fresh ASW, individual neurons were manually isolated and placed on raw, silicon shards. The silicon has been previously cleaned with piranha solution consisting of a 3:1 mixture of concentrated sulfuric acid with hydrogen peroxide; caution, this solution is a strong oxidant and a strong acid, and proper safety precautions must be followed for its safe handling. The cleaned silicon was covered with 3 mL of ASW supplemented with antibiotics: 100 units/mL penicillin G, 100 μg/mL streptomycin, and 100 μg/mL gentamicin, and a saturated concentration of amphotericin B. The cell cultures were allowed to develop overnight at 20–25 °C. After the cultures developed, they were treated using several different protocols as outlined below, including preservation with formaldehyde (FA), paraformaldehyde (PFA), and glycerol. In addition, some of the samples were sputter-coated with Au and rinsed with water. These treatments were used in many different combinations, as summarized in Table 1. Each combination of treatments was performed on at least three Si shards with several cultured neurons on the surface of each shard. Some cultures were rinsed with deionized (DI) H2O, as noted in Table 1, by adding 3 mL of DI H2O to the culture solution. The culture was incubated for a short period of time (~5 min), followed by the removal of 3 mL of solution, leaving a culture solution with half of the initial salt concentrations. This rinsing process was optimized by varying the number of repeated rinses; we found that a minimum of three rinses, resulting in at least an 8-fold reduction in salt concentrations compared with the initial culture solution, produced optimal results. Some cultured neurons were preserved using FA, PFA or glycerol (see Table 1). Different concentrations were used in order to optimize the level of each preservative required for the best results. The lowest possible concentrations needed to achieve effective cell preservation were chosen for this study—4 % FA, 4 % PFA, or 5 % glycerol (all wt/vol) in ASW. Each preservative (1 mL) was added to a culture solution and the solution agitated by drawing it gently in and out of a pipette. Following a 30 s incubation period, 3 mL of solution was removed and replaced by an additional 3 mL of preservative. The solution was again agitated and then incubated for 30 s. The entire solution was then removed with care and the samples gently dried manually under a stream of nitrogen. Samples were stored in a vacuum dessiccator at 20–22 °C following treatment(s) until Au coating or SIMS imaging. Some cultures were removed from the vacuum dessiccator and placed in a DESK II TSC turbo sputter coater (Denton, Moorestown, NJ, USA). The sample was affixed to the stage using double-sided copper tape. The sample rotation feature of the sputter coater was not employed. Samples were coated with varying amounts of Au ranging from 5 to 21 s (equating to 1.5–6.7 nm); 10 s (equating to approximately 3.2 nm of Au) was found to be ideal for this application and was used here. Each cultured neuron was imaged using a TRIFT III TOF-SIMS mass spectrometer (Physical Electronics, Chanhassen, MN, USA) equipped with a gold liquid metal ion gun operating at 22 keV. The primary ion beam was randomly rastered in a 256 pixel × 256 pixel region at 8 kHz and 25-ns pulse width. Mass spectra were collected in the 1–2000 m/z range. Total ion doses were below the static limit of 1013 primary ions cm−2. Charge compensation was used for all samples except those that were Au coated. The parameters of ion current, raster width, and resulting spatial resolution and the time of acquisition for each sample are shown in Table 1. Data was analyzed using WinCadence software (Physical Electronics, Chanhassen, MN, USA). SIMS is a surface technique that has been successfully used to probe cells and tissues over the last decade. As with most mass spectrometric approaches, the details of sample preparation can often determine the success of a measurement. Due to the higher spatial resolution afforded by SIMS imaging compared with MALDI imaging [37, 38, 39], analyte redistribution issues can become critical. Here we investigate cultured neurons of particular interest because the details of how lipids and other molecules change their distributions during network formation are not completely understood. As in vitro neuronal networks can resemble in vivo networks, observations from cultures should lead to further insight into in vivo neuronal function and development. The focus of this study was to optimize the sample preparation process in order to allow the fine structure of cultured neurons to be imaged. Multiple sample preparation protocols were optimized (for individual results) and compared using neuronal cultures from the well-characterized model Aplysia californica. These preparation methods included DI H2O rinses, preservation with FA, PFA, or glycerol, coating with a layer of gold, and combinations thereof. Neuronal cultures were incubated overnight, allowing some Aplysia neurons to produce outgrowths measuring tens to hundreds of micrometers in length. These neurons were subsequently subjected to each of the sample preparation methods being evaluated, and then analyzed using SIMS imaging. As shown in Figure 1, we compared ion images of neurons that were not treated (raw), rinsed with DI H2O, and chemically stabilized. The images of the untreated neurons illustrate the need for additional sample pretreatment as they exhibit low ion intensity and poor image definition. The images of neurons rinsed with water alone show improved image clarity and a slight improvement in ion intensity; however, water rinsing can lyse cells due to the difference in osmotic pressures, and surface tension forces can also have a damaging effect. In addition, only a fraction of the cationic salts from the sample surface are removed during this procedure. These salts can be removed using a rinse with a volatile inorganic salt such as ammonium acetate (data not shown) as previously described . This method will not be discussed further as glycerol or PFA combined with a water rinse also reduced cationic salts. Of the different preservation methods tested, PFA, and FA are commonly used microscopy fixatives that act by crosslinking primary amine groups. Selected ion images from neurons preserved with FA and PFA are shown in Figure 1. Interestingly, FA increased the background signal, and did not enhance lipid or lipophilic signals. PFA worked as a fixative with greater success for SIMS imaging. In the ion image of the PFA-fixed neuron, the PC fragment signal can be seen extending from the neuron throughout its neuronal processes. Although these images show low signal in the cell soma area, the neuronal processes can be clearly seen. Glycerol also acts as a cell stabilizer ; the corresponding ion images in Figure 1 demonstrate glycerol’s ability to preserve cell morphology while retaining good ion intensity from the cell soma, and it allows visualization of neuronal processes in the PC fragment ion image. It should also be noted that glycerol did not particularly enhance other ions’ intensities. These experimental results demonstrate that PFA and glycerol are both suitable for imaging cultured neurons using SIMS. Neuronal cultures were also imaged using some of the aforementioned preservation methods with the addition of a thin layer of gold, with results shown in Figure 2. Thin gold coatings increase ion yield for higher m/z ions, especially when combined with a gold liquid metal ion gun [7, 41, 42, 43]. This effect may be explained by the gold coating “softening” the impact of gold ions on the sample surface, thereby producing less fragmentation and leading to the detection of higher m/z intact molecules. As many analytes of interest have an m/z >250, the gold coating can be effective. However, this gold treatment hindered determination of spatial distributions by consistently creating a “halo” effect in images from these samples. In addition, the ion intensities from lipid fragments were greatly reduced. Experiments with gold coatings varying in thickness from 1.5 to 6.7 nm (data not shown) were unsuccessful in ameliorating these effects. While gold coating increased the ion intensities in the higher m/z range, the tradeoff of losing spatial information makes this approach less ideal for targeting the imaging of neuronal processes and growth cones. When either of the two more effective chemical stabilizers, glycerol and PFA, were combined with a water rinse, SIMS imaging of cultured neurons was further improved. Figures 3 and 4 show the imaging of a growth cone and neuronal terminal, respectively, from neurons for the first combination tested, glycerol fixation combined with water rinsing. This combination preserved cell morphology and reduced the signal from inorganic cations without lysing. In Figure 3, the neuron was imaged twice—once as a whole and a second time focused just on the growth cone region of the neuronal process. The distribution of the vitamin E fragment indicates its presence in the cell soma but in lower amounts along the process, and its absence within the growth cone. The PC fragment differed in that it was found to be present ubiquitously, although at lower intensities, within the growth cone area. Using the same sample preparation procedure, the tip of a neuronal process was imaged at higher resolution (Figure 4); an optical image, and a wide field of view mosaic SIMS image of a grouping of neurons, as well as a high resolution (390 nm pixel size) ion image of the tip of a neuronal process are shown. As seen in the higher resolution images, PC fragments and a low concentration of vitamin E at the tip of this neuronal process are observed. This differs from the neuron shown in Figure 3, where vitamin E was absent from the growth cone. In the second combined approach, a cultured neuron was prepared by fixing the cell with PFA and then rinsing with water. Similar to glycerol, this preparation also proved sufficient in reducing the presence of inorganic cation signals (images not shown). Selected ion images as well as an optical image are shown in Figure 5. This neuron had a single process with several outgrowths and growth cones. The ion image for the PC fragment illustrates that excellent image contrast for the fragment in the process region was achieved using this technique. The signals from the vitamin E and PC fragments were found to be diffuse around the cell soma, perhaps indicating that that this cell may have been damaged during the fixation and washing process. This cell was one of many cells analyzed using PFA and a water rinse, and this protocol frequently resulted in these diffuse signals from the vitamin E and PC fragments, suggesting that this preparation both lyses cells, and results in clear images for lipids in the neuronal processes. A slight increase in the vitamin E fragment signal was observed at the distal end of the growth cone in comparison to the background, indicating that subcellular vitamin E distribution may vary according to time, cell state, or perhaps a combination. By combining different preparation methods, the resulting ion images show subtleties in the spatial distribution of vitamin E within the cell membrane as well as maintaining the excellent image contrast obtained from the PC fragment. Multiple sample preparation and preservation strategies have been optimized and compared to determine which methods, or combinations thereof, best preserve neuron morphology and yield ion images of the distribution of lipid fragments and lipophilic species from cultured neurons. Water rinses alone were sufficient for reducing inorganic cation signals (e.g., sodium ions) to levels that enabled improved ion intensities for several cellular constituents, whereas combinations of water rinses and fixative/stabilizers appeared effective for preserving the fine structure of the cultured neurons. Au coating was helpful in increasing the signal from higher molecular weight analytes; for example, the signal from cholesterol was improved with an Au coating, but imaging was more difficult compared to either the vitamin E or PC fragments that were prepared using the other strategies tested. With the neurons used here, vitamin E appeared to be localized primarily within the cell soma, but lower levels were found along the processes and in the distal regions of the larger growth cone. We demonstrate that by employing preparation strategies that have been optimized for the analyte of interest, neuronal processes and growth cones can be imaged from cultured neurons. This not only illustrates the importance of using analyte-specific preparation techniques, but also that experimenting with multiple sample preparation strategies can be helpful in ensuring that the greatest information content is obtained. Future investigations using neuronal cultures will focus on changes taking place in the subcellular distributions of these chemical entities during neuronal network formation. Future instrumental enhancements include the use of cluster sources and the combination of SIMS with additional imaging modalities such as scanning electron microscopy for a more accurate evaluation and registration of membrane morphology and chemical content. The project described was supported by award no. P30 DA018310 from the National Institute on Drug Abuse and award no. R01 NS031609 from the National Institute of Neurological Disease and Stroke. The content is solely the responsibility of the authors and does not necessarily represent the official views of the awarding agencies.